Turbos Flamas snacks by Sabritas are a new way to set your mouth on fire. Now crunchier, bigger and hotter! Turbos Flamas by Sabritas are corn-based snacks that have a spiral shape similar to rotini pasta. They are covered with a very red spicy chili, and lime seasoning. The high level of redness and the flavor are both similar to Takis Fuego, except the shape is different. 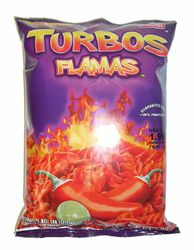 It has a delicious and intense taste, Turbo Flamas by Sabritas have more heat and are less strong than Takis Fuego. Now crunchier, BIGGER and Hotter!! Mas Crunch, Mas Big, Mas Hot!! Turbos Flamas de Sabritas son una botana a base de ma�z y tienen una forma espiral similar a la pasta rotini. Est�n cubiertas de un sazonador rojo de chile picante y lim�n. El alto nivel de enrojecimiento y el sabor son similares a Takis Fuego, con excepci�n de que la forma es diferente. Tiene un sabor rico e intenso, Flamas Turbo por Sabritas tiene m�s calor y es menos fuerte que Takis Fuego. Ahora son mucho mas crujientes, grandes y picantes!! Mas Crunch, Mas Big, Mas Hot!! Prende tu boca con los nuevos Turbo Flamas de Sabritas. Tastes just like Hot Cheetos, twist style. With a lime aftertaste.